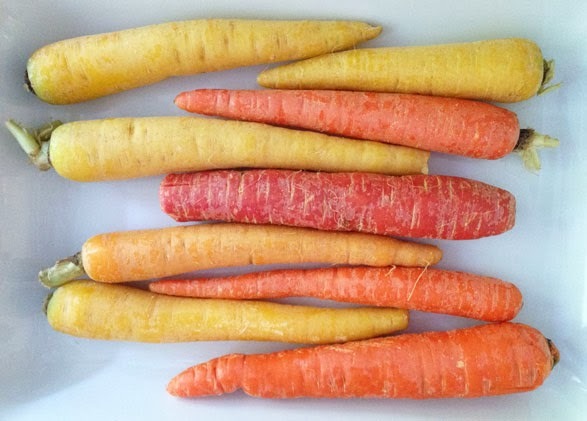 I bought beautiful red, yellow and orange heirloom carrots from Trader Joe's this week and although I was tempted to roast them and serve them caramelized, I just had to make my favorite Carrot Ginger Soup recipe. It's turned super chilly in Los Angeles and this recipe is perfect for warm lunch. I prefer my soup on the thicker side and my husband always teases me that it's more like porridge. You can thin it out by adding more chicken stock if you prefer. This soup is so good that I constantly have it in my refrigerator and sometimes I eat it cold right out of the tupperware as I'm warming a bowl up in the microwave! Spray olive oil on baking pan covered with aluminum foil. 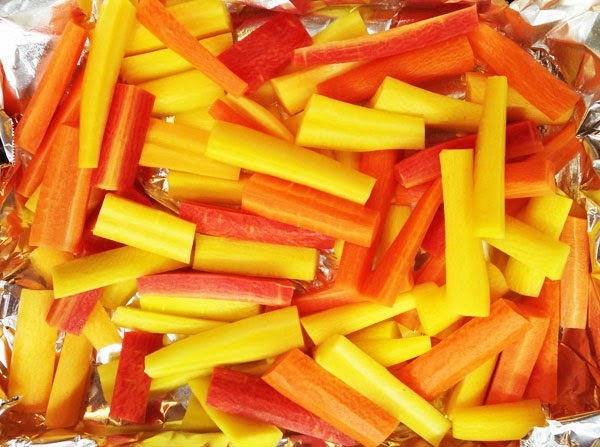 Peel and chop carrots into 1/2" sticks and arrange in a single layer pan. Peel and chop ginger and shallot and arrange with carrots on baking pan. I chop these in larger chunks so they don't burn while the carrots are roasting. Drizzle with olive oil and roast for 30 minutes until tender and caramelized. Combine roasted carrots, chicken stock, salt & pepper in a large saucepan or dutch oven on the stovetop. Cook over medium high heat until thoroughly heated (10-15 minutes). Serve with a dollop of greek yogurt and pumpkin seeds. Enjoy! Baby carrots are a great substitute for the 1lb bag in order to save time peeling and chopping. Just use two 1lb bag of baby carrots. Low fat sour cream is a good substitute for the Greek yogurt. I use my toaster oven to roast the carrots, ginger and shallots. I find it much easier to use than my oven. 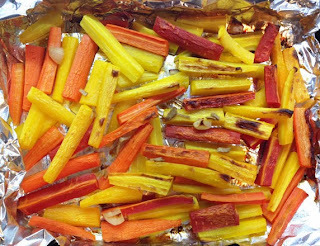 I roast all kinds of things in my toaster oven (I'm a bit obsessed with it)! 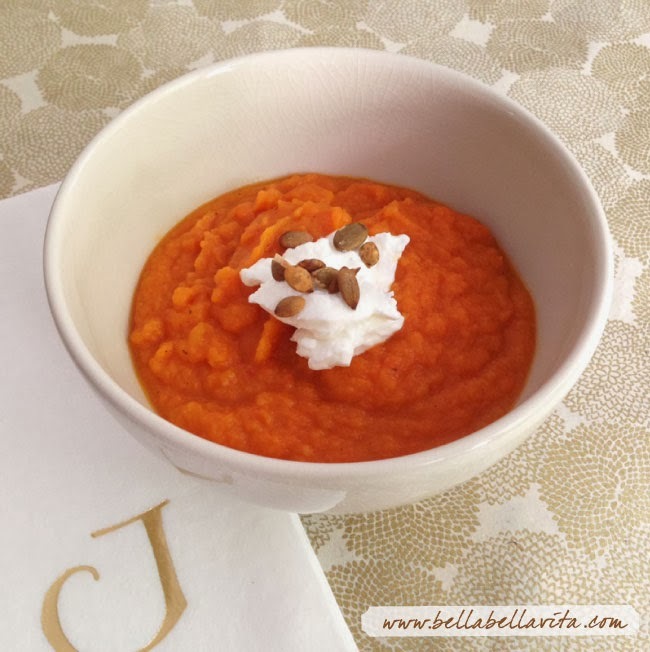 Don't miss my other soup recipe posts .... they are all low-fat and yummy! If you have the Paprika recipe app and would like to download the recipe, please email me and I'll send it to you in the correct format.